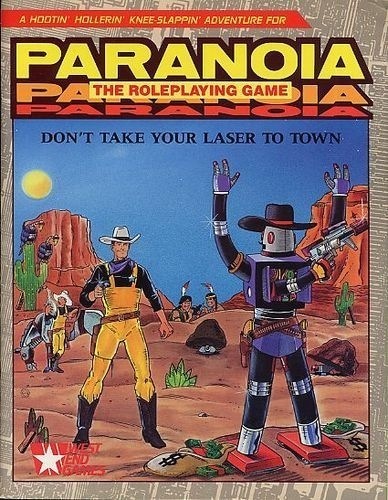 Don't Take Your Laser to Town is a Yellow clearance Paranoia adventure for 2-6 players, filled with page after page of cliff-hanging exploits from a time when clones were clones and bots were bots and player characters were cowering under buildings. This adventure includes marginal notes on recreating the Old West... like it was in the movies. Hysterical uh, historical figures are turning over in their graves because of what we're doing to them. Fresh air. Stale jokes. And more worn out cliches than you can shake a rattlesnake at. Add some o' the meanest, baddest bots this side of the Rio Grande (like Black Bot and his murderous cutthroat band of thieves), and you've got one hell of a rootin' tootin' adventure. Pull up a barbed-wire tumbleweed, and set a spell. Sign in to start a discussion about Paranoia RPG: Don't Take Your Laser to Town!